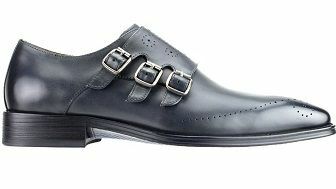 With three buckles on the side and made of rich gray color leather, you know these ain't your Daddy's Florsheim's. These are what Steven Land shoes are all about. Featuring cutting edge designer style that Steven Land is famous for, these designer style leather dress shoes will let you look your best.